Shark Attack cannabis seeds by Dinafem Seeds belong to a feminised, Indica-dominant cannabis strain obtained by crossing a Super Skunk and a White Widow, which resulted in a hybrid with several medicinal properties that will delight Indica lovers. This queen of Indica is a great choice for those seeking a soothing, relaxing feminized cannabis strain that flowers fast and is well suited to small indoor spaces. 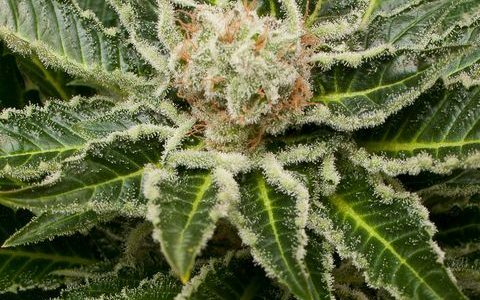 It grows into a beautiful, easy-to-grow, vigorous marijuana plant that produces thick, compact, resinous buds, providing abundant quality crops regardless of the experience of the grower. Dinafem Shark Attack cannabis seed performs well both indoors and outdoors in a temperate/Mediterranean climate or in a greenhouse if fed a standard diet. Moreover, it is important to watch out for humidity at the end of flowering. Boasting unique properties, this classic by Dinafem is a very much appreciated feminized seed.